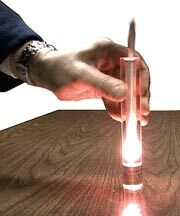 The Fire Syringe is a classic example of the Ideal Gas Law (PV=nRT). By compressing air into a smaller volume, we are also increasing the temperature. Looking at the formula, a large increase in P, a small decrease in V, with n and R being constant, leads to a large increase in T.
Kit includes: aluminum piston, lexan piston chamber, and 2 custom made o-rings. You will also need to supply tiny pieces of non-moisturized tissue paper. Setup: The setup is quick and easy. Pull out the syringe, drop in 3-4 tiny 5 mm or so tissue pieces. Then re-insert the aluminum piston gently so that it just enters the mouth of the piston chamber. Holding the unit flat on a non-slip surface, push down the aluminum piston with some force and speed. You will see a quick flask of fire, which will last until all available oxygen is used up. How it works: Air gets very hot when compressed under high pressure. If you have ever pumped up a bicycle tire, you have noticed the heat generated. When the air in the fire syringe is compressed, it is done so fast and efficiently, so that it can reach a temperature of over 260 degrees C (500 degrees F). As paper burns at 235 dgrees C (454 degrees F), the small pieces of tissue paper ignite. Maintenance: Your syringe has been pre-lubricated and should not need any more. After each use, blow out the carbon dust from the small fire you just made and it is good to use again.